The Ankara Chief Public Prosectur's Office has launched an investigation against Akit TV Ankara News Director Mehmet Özmen, who previously stated in a TV program that the public opinion of Turkey wants the capital punishment of people such as Abdullah Öcalan, Fethullah Gülen and Kemal Kılıçdaroğlu, the Chair of main opposition Republican People's Party (CHP). Before the investigation, Vice Chair and Spokesperson of the party Faik Öztrak stated that they would file a criminal complaint against Özmen. "The public opinion of Turkey is against the feeding of Öcalan [imprisoned leader of Kurdistan Workers Party (PKK)] in İmralı, they want him to be executed on this scaffold. The public opinion of Turkey also expects Fethullah Gülen, the leader of FETÖ [held responsible for the coup attempt on July 15, 2016] to be brought from Pennsylvania and be executed here. "I think that they also expect that people such as Kemal Kılıçdaroğlu, who are the partisans of the PKK and FETÖ terrorist organizations, who take them under their wings and feed them in their bosoms, to be hanged on this scaffold, they expect them to be executed as well. It is, of course, our opinion; judgement rests with the public opinion." "We cannot solely see it as an individual initiative of a contemptible channel. These despicable remarks were uttered when Justice and Development Party Chair was letting out 'yells of capital punishment' at the squares." 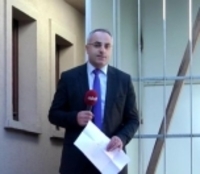 Öztrak also added that the attorneys of the party would file a criminal complaint against Akit TV News Director Mehmet Özmen. "We made a mistake. We abolished the capital punishment. To me, we made a mistake there. Why? Because it offends my feelings that we are feeding the ones who martyrized our 251 citizens, soldiers and police officers at the night of July 15 in prisons though they have been sentenced to life imprisonment or aggravated life imprisonment. "If our parliament passes a decision about it, I will approve." Erdoğan brought up the issue of capital punishment after the coup attempt in 2016. He said, "If it passes from the parliament, I will approve it." Speaking in Trabzon after returning from the 5th Bali Democracy Forum in November 2012, Erdoğan also argued that states should have the right to kill their citizens under certain conditions. Erdoğan said, "Look, today, there is capital punishment in the US, in Russia, in Japan. There is capital punishment in several parts of the world." From 1920, when the Grand National Assembly of Turkey (TBMM) was established, to 1984, when the last capital punishment was executed, a total of 712 people, 15 of whom were women, were executed in Turkey. EVRİM KEPENEK'S IMPRESSIONS: Politicians in a Race to 'Speak on Behalf of HDP Voters', but What do 'HDP Voters' Think?